Day 1 – Nairobi / Aberdare National Park Arrival at the Jomo Kenyatta International Airport aboard a morning flight, met by our representative and depart in your 4 x 4 safari converted van to Aberdare National Park via the lush central Kenya highlands and scenic landscape. Check in followed by lunch at your tree lodge, located deep inside Aberdare National Park. This evening and night, game viewing will be from the comfort of a special raised bunker as you watch animals visit the lodge’s flood – lit water hole and salt lick. Dinner and overnight stay at your lodge. Day 2- Aberdare /Lake Nakuru National Park After breakfast, check out, meet your driver / guide and drive in a south westerly direction across the equator, then down the floor of the rift valley to Lake Nakuru. Check in followed by lunch. Afternoon game drive from 1600 hrs with an opportunity to see Lake Nakuru, the alkaline lake that hosts several bird species and plenty of animal species like Buffalos, White Rhinos, Water Bucks, Lions, Leopards and Rothschild Giraffes among others. Dinner and overnight stay at your lodge / tented camp. Enjoy an afternoon game drive from 1600 hrs, the beginning of the amazing Masai Mara game viewing experience. Dinner and overnight stay at your lodge/ tented camp. Day 4- Masai Mara Early morning and late afternoon game drives in search of the BIG 5; Lion, Buffalo, Elephant, Rhino, and Leopard and several other animals including Impalas, Gazelles, Wildebeests, Hyenas, Topis, Zebras, Giraffes and hundreds of bird species. 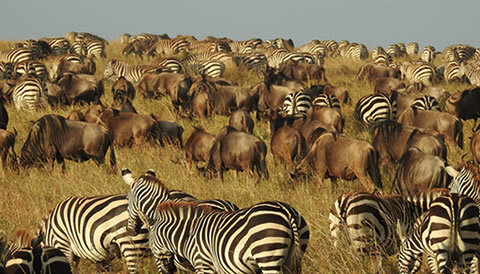 Being a southern extension of Tanzania’s Serengeti, the annual Wildebeests Migration from Serengeti to Masai Mara also takes place here between July and October when millions of Wildebeests and Zebras closely trailed by the Big Cats cross the Mara River and roam the reserve’s plains in search of greener pastures. Rest of the time at leisure in your lodge.All meals and overnight stay at your lodge. Day 5- Depart Breakfast will be served from 0630 hrs. Check out by 0730 hrs and drive back to Nairobi. OPTIONAL lunch will be served at a restaurant followed by transfer to the Jomo Kenyatta International Airport for your onward evening flight. End of the 4 Nights 5 Days Kenya Wildlife Safari. *All items of a personal nature such as tobacco; laundry; phone calls, drinks during meals, etc.